I am never one to turn away from the tide of the lemmings. I delude myself, now and again, into believing that I am independent thinker, forging a new and exciting direction that will lead to no less than peace and prosperity in the Middle East.... and then I knit a caliometry - just because everyone else is doing one. I create this blog because is efficient - record it once, document it once, link to it a thousand times. 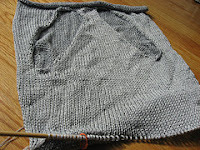 (linking to a thousand boards - no wonder I knit so slow!) I like to write and I think it might be instructive to refer back to where I have been. Eh, voila! This is what I am thinking and knitting right now. 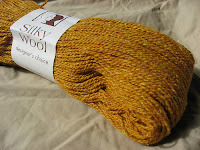 I am holding a double strand of this shimmery dk weight stuff together. I got stitch gauge, but not row gauge, so I am trying to be mindful of these consequences. So far, so good. I am knitting size small that should fit to a 36 and I am a 40, due to many suggestions out in web land. When I tried it on it seems to fit great - just a smidge too low, but I think I can live with it.